When Matsuko dies of murder, her nephew Sho gets to progressively unveil many details of her mysterious past, discovering she wasn't only a forgotten outcast but led a very interesting yet bizarre life. Male itsuki fujii: [Checking out books from the female Itsuki in the school libray. The male Itsuki holds up five checkout cards that he has been the first to sign like a poker hand. He speaks in English] Fujii Itsuki straight flush. 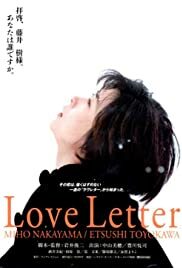 The first 30+ minutes of "Love Letter" were quite boring, but if you ever watched the movie again, knowing how the plot unfolds, they'd be anything but boring. The premise of this is cool and a little creepy: a woman, enstranged by her husband's untimely death, sends a letter to his old address. She knows that the house was knocked down and built over by a highway years ago, but does it anyway, perhaps out of desperation. Unexpectedly, she gets a reply. From there, the story begins, and it takes a much different direction than how the plot sounds on paper. I can't really say too much without spoiling it, but this is a tragic movie, yet beautiful at the same time. There are flashback sequences that make you really care about several characters in the movie, including the deceased man (who is shown as a school boy in the flashbacks). This is so well set out, and almost brought me to tears at times. Movies like this are what make me want to see more and more Asian cinema, because this was an absolute epic.